Cick image to view larger size. One of our apex predators, the Mountain Lion, also known as a Cougar, Puma, Panther or Catamount is North America’s largest cat. They’re wide ranging, with the exception of humans, this cat has the largest range of any mammal in the Western Hemisphere. They’re found from Canada to Argentina. In North America alone, they can be found from British Columbia and southern Alberta to California and Texas. Small populations can also be found east of the Mississippi River. The Florida panther is found in isolated populations in Florida. They’re a very acrobatic and athletic predator, they have the ability to jump fifteen feet into the air or leap up to forty feet across the ground. 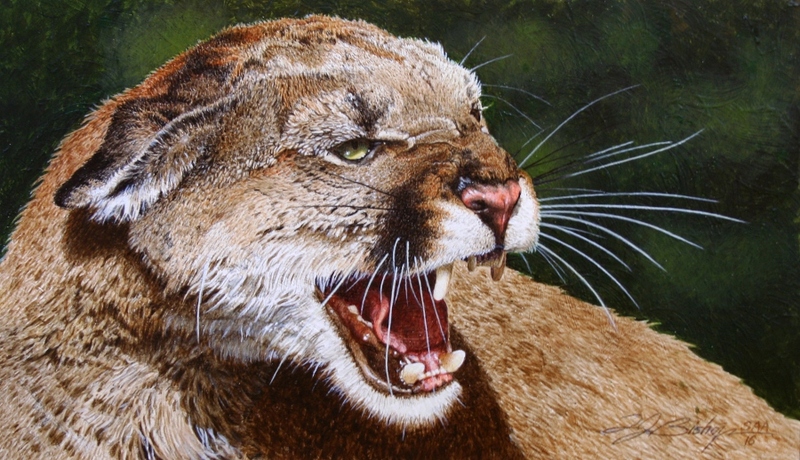 The image I’ve painted in “Not a Happy Face”, is a Mountain Lion showing its displeasure with some type of aggressor, intruder, or an antagonist….where it will initially spit, hiss or snarl to try and drive off whatever it’s being confronted with and if that doesn’t work the cat is fully equipped with razor like claws and large fangs that are lethal enough to take down the Deer, Elk and in some cases Bison.